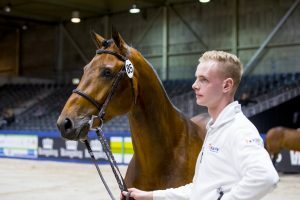 On the first day of the KWPN Stallion Show the well-bred Ludovicus A (s.Edinburgh), co-owned by his breeder Jos Althuyzen, received an invitation for the KWPN performance test. During the presentation of the last year’s approved stallions, Kardinaal HX and Kempinski made a good impression. Tomorrow Gaspahr will compete at the KWPN Stallion Show in the 1.40m VHO Trophy class.